Play as Sir Arthur and fight vile monsters of the underworld in your quest to rescue the fair princess Prin-Prin. 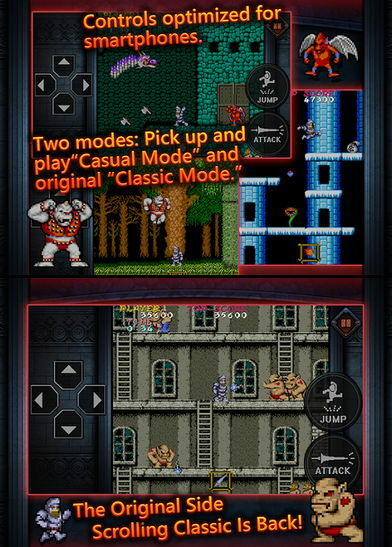 Ghosts'n Goblins MOBILE is the original side-scrolling action platformer remade for mobile devices and optimized for phones and tablets. - Equip Sir Arthur with better weapons and armor by unlocking chests through the levels. 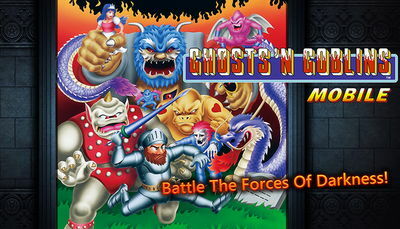 - Battle epic bosses such as a dragon, Cyclops and devils. - Touch controls optimized for mobile. - Can you reach the end and become a legend! - Play in Casual mode or Classic mode and see if you have what it takes to win one of the most challenging patformers ever made!